Archon Ultra is a significantly enhanced version of the original classic Archon by Electronic Arts. In it, two-players battle each other in a game that resembles chess in visual appearance, but with many RPG-style features and the requirement of reflexes thrown in. 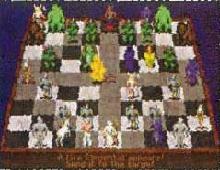 The gameplay itself, like Archon's, is similar to chess in many ways. A board with alternating black and white squares is set up in on which both sides (light and dark) take turns moving a single piece. Each piece has a certain number of squares into which it can be moved, and some pieces can fly over others instead of being forced to walk around them. Unlike chess, the pieces on the light and dark sides are completely separate from each other. The pieces on the light side represent "good" creatures (e.g. Phoenixes, Djinnis and the "good and noble" Wizard) while the dark side employs evil beings (e.g. Dragons, Shapeshifters, Goblins, and of course the "evil and deceitful" Sorceress). When a piece from one side lands on a square occupied by a piece from the opposing side, they both will enter a large arena and fight. An interesting variation (which was present in the original Archon) is that some of the colors on the game board will change color slowly, alternating between white and black as the game progresses. If a battle is fought on a black square, a dark and fire-pervaded landscape will serve as the arena, and the evil character will automatically be granted extra hit points. If a conflict ensues on a white square, the battleground will be a peaceful and serene forest, where the good character will enjoy the same advantage. In addition to more gameplay options than the original, and excellent VGA graphics, Archon Ultra also offers modem play that is very smooth even at 2400 baud. It is a shame that SSI did not convert Archon II into a PC version and include it with Archon Ultra, but that's a minor point considering all the significant enhancements present here. While Archon Ultra is more of an evolution rather than the revolution that its predecessor was, it manages to retain all of the elements that made Archon a masterpiece, and improve on them. Two thumbs up!